We are pleased and proud to share news that UCLA Gastroenterology and GI Surgery placed No. 7 in the nation for the 2018-19 annual U.S. News & World Report rankings. We are equally proud that U.S. News recognized our hospitals as No. 7 on the national honor roll. Dr. Jacobs, director of the Microbiome Core in the UCLA Microbiome Center, and Dr. Dong, GI fellow and T-32 recipient, examined the microbiome and bile acid in patients with advanced liver disease. Their article is titled, “Microbiome and bile acid profiles in duodenal aspirates from patients with liver cirrhosis: The Microbiome, Microbial Markers and Liver Disease Study.” Other authors included Dr. Vatche Agopian, UCLA Department of Surgery, Dr. Francisco Durazo, chief of UCLA Transplant Hepatology, Dr. Jihane Benhammou, UCLA STAR fellow, and Dr. Shehnaz Hussain, UCLA School of Public Health and Cedars-Sinai Medical Center faculty. The array of authors represents a nice collaboration between faculty at multiple institutions. The work was supported by an NIH RO1 grant to Dr. Hussain and sub-awarded to Drs. Agopian (UCLA) and Jacobs (VA). The AGA convened a two-day conference of colorectal cancer and technology experts to develop recommendations on improving colorectal cancer screening and surveillance. “This is a retreat of many of the foremost experts in colorectal cancer screening prevention. We will spend two days evaluating how we screen patients, and asking how we can push ourselves to do even better. Artificial intelligence, emerging endoscopic technologies, the microbiome and diagnostic markers are all on the table for discussion,” says Dr. Muthusamy, director of endoscopy for UCLA Health System and chair of the AGA Center for GI Innovation and Technology. The conference took place in Washington, DC in early December. Dr. Nordstrom, co-director of the GI Fellowship Program, contributed to “Burden of Gastrointestinal Symptoms in the United States: Results of a Nationally Representative Survey of Over 71,000 Americans,” which was published October 15, 2018 in AJG. Healthline consulted Dr. Emeran Mayer, director of the G. Oppenheimer Center for Neurobiology of Stress and Resilience and co-director of the CURE: Digestive Diseases Research Center at UCLA, in a report on the latest research concerning the prescription of probiotics to curb the negative effects of antibiotics. Dr. Emeran A. Mayer, director of the G. Oppenheimer Center for Neurobiology of Stress and Resilience and co-director of the CURE: Digestive Diseases Research Center at UCLA, commented in a Consumer Reports story about the risks and benefits of probiotic supplements. Dr. Saab’s abstract titled, “Economic Comparison of Serologic and Molecular Screening Strategies for Hepatitis C Virus,” was published in the August 2018 issue of Gastroenterology and Hepatology. Dr. Yanny’s abstract titled, “Eight-Week Hepatitis C Treatment with New Direct Acting Antivirals Has a Better Safety Profile While Being Effective in the Treatment-Naïve Geriatric Population Without Liver Cirrhosis and Hepatitis C Virus-RNA < 6 Million IU/mL” was published in the December 2018 issue of Digestive Diseases and Sciences. The November 2018 AASLD-accepted abstracts include (1) “Approaches to Hepatitis B Vaccination Non-Response” (oral presentation) and (2) “Largest Series Exploring Implications of Gamma-Glutamyl Transferase Elevation in Post Liver Transplant Recipients, an Analysis of 511 Consecutive Patients” (poster presentation). Soma Wali, MD, chief of the Department of Medicine at OIive View-UCLA Medical Center, announced Dr. Beaven’s appointment to chief of GI on November 2, 2018. Dr. Beaven attended Stanford University where he majored in mathematics with honors in humanities. He went on to receive his MD from the University of California, San Francisco, and received the Dean’s Research Prize for work he performed in the laboratory of Dr. Scott Friedman under a Howard Hughes Medical Student Research Fellowship. Dr. Beaven completed internal medicine residency training at the Brigham & Women’s Hospital and Harvard Medical School in Boston. He came to UCLA in 2003 as a fellow in digestive diseases where he completed his gastroenterology fellowship. During this period, Dr. Beaven continued his research training and received a PhD with Dr. Peter Tontonoz in the Howard Hughes Medical Institute and Department of Pathology. He then joined the UCLA faculty as a hepatologist and has done extensive research in this area. Dr. Beaven joined the Olive View faculty on a part-time basis two years ago and has been an important part of the division’s clinical and education missions. Los Angeles Business Journal, MyNewsLA and LA West Media reported on a $3.5-million grant from the National Institutes of Health to establish a center for the early detection of liver cancer. The team, led by UCLA Jonsson Comprehensive Cancer Center members Dr. Xianghong Jasmine Zhou, Dr. Steven-Huy Han and Dr. Samuel French, is developing an effective and affordable blood-based test. Dr. Zhou is a professor of pathology and laboratory medicine, Dr. Han is a professor of medicine and surgery, and French is an associate professor of pathology and laboratory medicine. Campus Queries: What Drives Us to Eat for Pleasure? A recent UCLA study suggests microorganisms that populate the human gut play a role in encouraging pleasure eating. The study, an interdisciplinary collaboration between the G. Oppenheimer Center for Neurobiology of Stress and Resilience and the UCLA Microbiome Center, found a connection linking levels of the metabolite indole – a compound produced when a certain amino acid is processed by gut bacteria – and the brain’s reward system. Drs. Arpana Gupta and Emeran A. Mayer were interviewed for Campus Queries, (What Drives Us to Eat for Pleasure), a Daily Bruin series in which UCLA professors and experts answer questions from readers and staff. Dr. Mayer, principal investigator, was awarded a Department of Defense grant titled “The Relationship Between Brain Functioning, Behavior, and Microbiota in Autism Spectrum.” This one-year project, provides $300,000 in funding. Dr. Gupta’s abstract titled, “Early Life Adversity Is Associated with Increased Susceptibility to Brain-Gut Alterations in Obesity,” was reviewed as part of the bio-behavioral research section abstract competition. Her abstract score among the top five and will be recognized at the section meeting during ObesityWeek 2018. Dr. Gupta received The Obesity Society’s (TOS) early career travel grant. TOS is a scientific membership organization dedicated to improving people’s lives by advancing the science-based understanding of the causes, consequences, prevention and treatment of obesity. This grant supports early career investigators in their efforts to contribute to the field of obesity. Well+Good interviewed Dr. Emeran A. Mayer for a story about the microbiome and its role in metabolism, inflammation and appetite. Dr. Mayer is director of the G. Oppenheimer Center for Neurobiology of Stress and Resilience and co-director of the CURE: Digestive Diseases Research Center at UCLA. Healio reported on a presentation by Dr. Lin Chang at the American College of Gastroenterology Annual Scientific Meeting about pharmacologic and non-pharmacologic therapies for irritable bowel syndrome. Dr. Chang is vice-chief of the Vatche and Tamar Manoukian Division of Digestive Diseases and co-director of the G. Oppenheimer Center for Neurobiology of Stress and Resilience. Clinical Gastrointestinal Endoscopy, 3rd Edition, by Drs. V. Raman Muthusamy, Vinay Chandrasekhara, Mouen Khashab and B. Joseph Elmunzer is now thoroughly up-to-date both in print and online. This all-new editorial team makes this reference an easy-to-use source of reliable information on a full range of topics, including anatomy, pathophysiology and therapeutic management options, in addition to the latest GI procedures and technologies. It also includes updated videos and revised photographs, anatomical drawings and other images. Psych Central, Medical Xpress, Health News Digest, Health Canal, News-Medical.net and Scienmag covered UCLA research identifying a link between metabolites produced by human gut bacteria and eating for pleasure, as opposed to for hunger. A Reddit post about the study was featured on the front page of the Reddit website and has so far received more than 14,000 votes and 700 comments. Dr. Emeran Mayer, director of the G. Oppenheimer Center for Neurobiology of Stress and Resilience and co-director of the CURE: Digestive Diseases Research Center at UCLA, is senior author of the study. Helio reported on UCLA research presented by Colleen H. Parker, MD, at DDW 2018 that found patients with more perceived stressful life events in adulthood are more likely to develop irritable bowel syndrome. Conversely, Parker and colleagues found that positive life events appeared to mitigate the effects of stressful life events on IBS. Emeran A. Mayer, MD, director of the G. Oppenheimer Center for Neurobiology of Stress and Resilience, was quoted in Today’s Dietitian about plant-based diets and the gut biome. The story quoted a speech Mayer gave at the Nutrition & Health Conference in May. Healio reported on UCLA research presented at DDW 2018 on a project to provide hepatitis C treatment to homeless Veterans. Omar Bakr, MD, is a resident in the UCLA IM training program and part of the May Laboratory team. Healio reported on UCLA research presented at DDW 2018 finding that certain bacteria in the gut microbiome helped predict whether cognitive behavioral therapy could reduce symptoms of irritable bowel syndrome. Dr. Jonathan Jacobs, an assistant professor in the UCLA Vatche & Tamar Manoukian Division of Digestive Diseases, was quoted. Dr. Jacob, STAR fellow, received recognition for his scientific accomplishment as an early career investigator for his abstract presentation titled, “Direct signaling of TL1A-DR3 on fibroblasts induces intestinal fibrosis in vivo.” The abstract was then selected as an oral presentation. David Padua, MD, PhD, was quoted in a Healthline article discussing the benefits of exercise for GI patients. Although those with GI conditions might find it difficult to exercise regularly, some research has shown that there’s a connection between higher levels of activity and fewer symptoms, especially with Crohn’s disease. Huffington Post featured the expertise of Dr. Guy Weiss in a story about diagnosing patients with celiac disease or gluten intolerance. Dr. Weiss is the program leader of the Celiac Disease Program at the Vatche and Tamar Manoukian Division of Digestive Diseases. Healio published an interview with Dr. Lin Chang about medical therapies for patients with irritable bowel syndrome. Dr. Chang is vice-chief of the Vatche and Tamar Manoukian Division of Digestive Diseases and co-director of the G. Oppenheimer Center for Neurobiology of Stress and Resilience. Dr. Emeran A. Mayer, director of the G. Oppenheimer Center for Neurobiology of Stress and Resilience and co-director of the CURE: Digestive Diseases Research Center, commented in a Gizmodo story about research looking at the possible connection between nitrate consumption and manic episodes. The Crohn’s and Colitis Foundation of America Inc. awarded Emeran A. Mayer, MD, director of the G. Oppenheimer Center for Neurobiology of Stress and Resilience (CNSR), a three-year grant, with an annual budget of $300,000, to study “brain-gut-microbiome signatures of stress-related IBD symptom flares.” This is the first collaborative effort between Jonathan Jacobs, MD, PhD, Jenny Sauk, MD and CNSR focusing on IBD patients. LiveScience, FierceBiotech, New Atlas, ScienceDaily, Tech Times, Genetic Engineering & Biotechnology News, BioTecNika, Slash Gear, Chemical & Engineering News, Laboratory Equipment, Scienmag and MyScience.org covered a UCLA study identifying specific gut bacteria that play an essential role in the anti-seizure effects of the high-fat, low-carbohydrate ketogenic diet. Elaine Hsiao, an assistant professor of medicine in the Vatche and Tamar Manoukian Division of Digestive Diseases, is the study’s senior author. Dr. Emeran A. Mayer, director of the G. Oppenheimer Center for Neurobiology of Stress and Resilience and co-director of the CURE: Digestive Diseases Research Center, was quoted in a McClatchy News story about the enteric nervous system in humans. The story appeared in the Sacramento Bee, the Modesto Bee, the Charlotte Observer, the Miami Herald, the Fresno Bee and 21 other publications. Prevention, in a story about promoting gut health, referenced a UCLA study on probiotics in yogurt and their impact on gut bacteria. Can Changes to Our Gut Bacteria Change Our Behavior? In a BBC Radio 4 series called The Second Genome, Kirsten Tillisch, MD discussed UCLA’s research into how the microbiome is implicated in the expression of mood, emotion and behavior. Dr. Tillisch, an associate professor of medicine in the Vatche and Tamar Manoukian Division of Digestive Diseases, appears in the “Gateway to the Mind” episode from 19:00-22:14. She also is quoted in a BBC News online article on the same topic, which was syndicated in Huffington Post Mexico. Dr. Chang, vice chief of the Vatche and Tamar Manoukian Division of Digestive Diseases, has been selected as the Clinical Research Councilor for the AGA Institute Governing Board. The AGA Institute Governing Board is responsible for overseeing the organization’s mission, strategic plan, programs and services. She will be starting her three-year term in June 2018. The American Association for the Study of Liver Diseases Foundation (AASLD Foundation) selected Dr. Patel as the recipient of the 2018 Advanced/Transplant Hepatology Award. This two-year, $30,000 award is intended to encourage the academic careers of exceptional hepatology trainees. Congratulations! An Eat This, Not That! story on nutrition and the metabolic clock referenced UCLA research on the impact of probiotics in yogurt on brain health. Kirsten Tillisch, MD, associate professor of medicine in the Vatche and Tamar Manoukian Division of Digestive Diseases, led the research. MSN also published the story. Sammy Saab, MD, professor of medicine and surgery and head of outcomes research in hepatology, was quoted in Healio: HCV Next on a study finding that early-stage hepatitis C treatment saves money and improves quality of life. Dr. Kirsten Tillisch, an associate professor of medicine in the Vatche and Tamar Manoukian Division of Digestive Diseases, discussed her research about the impact of probiotics on brain response in a CNBC story about boosting productivity. The story also ran on Yahoo! Finance. What's the Mind-Gut Connection and How Did It Evolve? Psychiatric Times featured Dr. Emeran A. Mayer, director of the G. Oppenheimer Center for Neurobiology of Stress and Resilience and co-director of the CURE: Digestive Diseases Research Center, in a podcast about the connection between the mind and the gut. The Kenneth Rainin Foundation announced today that it has awarded $1.7 million in grants through its Synergy Awards program. Funding will support teams of researchers who are pursuing collaborative projects aimed at improving the prediction and prevention of Inflammatory Bowel Disease (IBD). “The Rainin Foundation focuses its grants on impacting patient lives, while still maintaining an eye toward discovery science,” said Laura Wilson, PhD, director of Health Strategy and Ventures for the Rainin Foundation. “We want to fund promising ideas from both IBD research and unrelated fields that have the potential to lead to new patient treatments.” The Synergy Awards encourage investigators with differing areas of expertise to pool their talents and resources toward a research goal that would not be possible if they worked independently. Dr. Padua and Karka Kirkegaard, Phd, Stanford University, were awarded $200,000 for IFNG-AS1 (NEST) long noncoding RNA as a regular of inflammation in IBD patients. 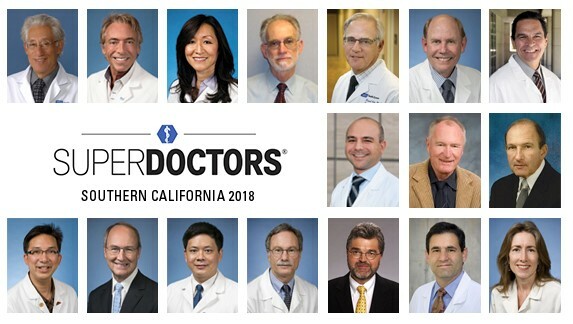 The selection process for Super Doctors is a rigorous multi-step process designed to identify physicians who have attained a high degree of peer recognition and professional achievement. Super Doctors is a selective yet diverse listing of outstanding doctors, representing consumer-oriented medical specialties. Physicians are asked to consider the following question: "If you needed medical care in one of the following specialties, which doctor would you choose?" 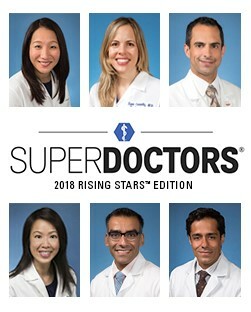 The selection process for Rising Stars and for Super Doctors are the same except: to be eligible for inclusion in Rising Stars, candidates must be active physicians who have been fully-licensed to practice for approximately 10 years or less. In a Today.com story about colitis, Dr. Daniel Hollander explained the types of stomach pains and symptoms that could indicate a serious medical issue. The story was syndicated on MSN. Dr. Hollander is an inflammatory bowel disease specialist and a professor emeritus in the department of medicine. Dr. Emeran A. Mayer, director of the G. Oppenheimer Center for Neurobiology of Stress and Resilience and co-director of the CURE: Digestive Diseases Research Center, was quoted in BigThink about the interactions between the gut and the brain in a story about the root of intuition. Healthline published an article about a study examining the impact of exercise on gut bacteria. The article featured the insights of Dr. Emeran A. Mayer, director of the G. Oppenheimer Center for Neurobiology of Stress and Resilience and co-director of the CURE: Digestive Diseases Research. Dr. Emeran A. Mayer, director of the G. Oppenheimer Center for Neurobiology of Stress and Resilience and co-director of the CURE: Digestive Diseases Research, was quote in an Experience Life story on IBS relief and the gut-brain process.